New to colored pencil? We can help! 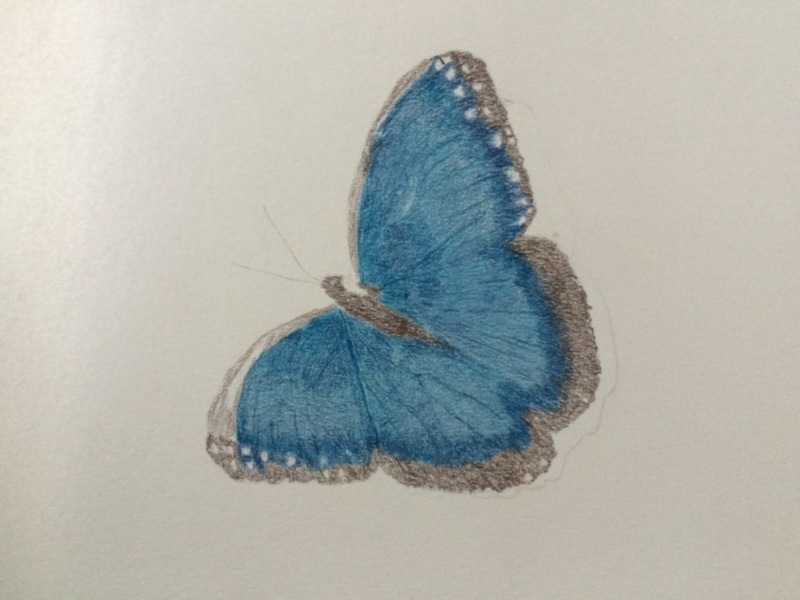 You can take trial and error straight out of your vocabulary with Jumpstart's clear, easy lessons.The ultimate way to gain confidence as a novice, the Blue Butterfly lesson will show you in 10 clear steps how to draw realism and soft blends with colored pencil. So let's get you started right - with simple instruction from Denise Howard that will let any newbie learn the ropes in a flash. In 10 easy steps you'll be signing your name to artwork as beautiful as this blue morpho butterfly. Think you can't do it? You can! Hi, this is my first experience with lessons and I am no artist ‍ by any means. This still in progress, but having fun learning. I am on step 6. Help me Ann... Thank you. I learned quite a lot from this tutorial. One issue that arose was that my butterfly was much greener than the example. My set of prismacolor pencils did not contain powder blue and cerulean blue. I substituted cloud blue and light cerulean blue and these were satisfactory. For the others I took the same pencils by name without actually checking the colors. For light aqua the color in my set was far greener than that in the color swatch as in the photo. I am a novice but I tried to fix this excess of green. I tried to overlay blues but this produced only minor improvement. Somewhat better effect came from using white as a blender. The result is attached. I used this in teaching a beginners Colored pencil class to adults. It worked out very well with supplemental exercises that I produced. If you don't teach with additional handouts, I would give at least 4 hours for the class. This would include transferring. I think the class got a lot out of this Beginners workbook because it introduced layering colored pencils, but with using similiar colors as well as other basic concepts. Why invent the wheel in teaching, when you have these wonderful packets to complement what you are teaching? Each students had the booklet to carry home, since most had some still to go, plus all the tips on CP that they can go over again. The price is very resonable if you buy as a classroom pack of 10 or more. I plan to do another in the next step level to build on what they learned here. I used this Jumpstart lesson with my students and they love it. It has taught them that lots of light layers make for a beautiful drawing. Their butterflies are lovely! Thank you, Ann!